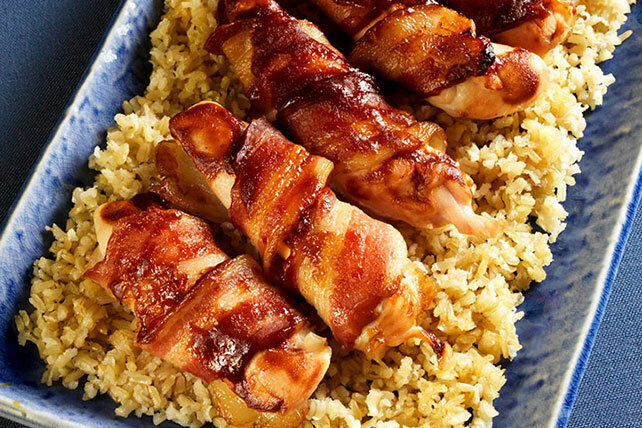 Enjoy Bacon-Wrapped Chicken on the Barbecue as your entrée tonight. Bacon always makes everything taste that much better. Place bacon, in batches if necessary, in single layer on paper towel-covered microwaveable plate; cover with additional paper towel. Microwave on HIGH 2 min. or until almost done. (Do not cook until crisp.) Cool slightly. Wrap bacon around chicken breasts; secure with wooden toothpicks. Place on rimmed baking sheet; brush with barbecue sauce. Bake 25 min. or until chicken is done (165ºF) and bacon is crisp. Meanwhile, bring broth to boil in medium saucepan. Stir in rice; return to boil. Cover; simmer on low heat 5 min. Remove from heat. Let stand, covered, 5 min. Fluff rice with fork. Serve with chicken.